For a small glimpse into the candy making past, here is a trade catalog from 1874. The title is Descriptive and Illustrated Catalogue of Goods from Thomas Mills & Brother, located in Philadelphia, PA and established in 1864. This catalog gives us an idea of nineteenth century candy making machinery. It also includes images of moulds and patterns for candy. Thomas Mills & Brother, Philadelphia, PA. Descriptive and Illustrated Catalogue of Goods, 1874, title page. 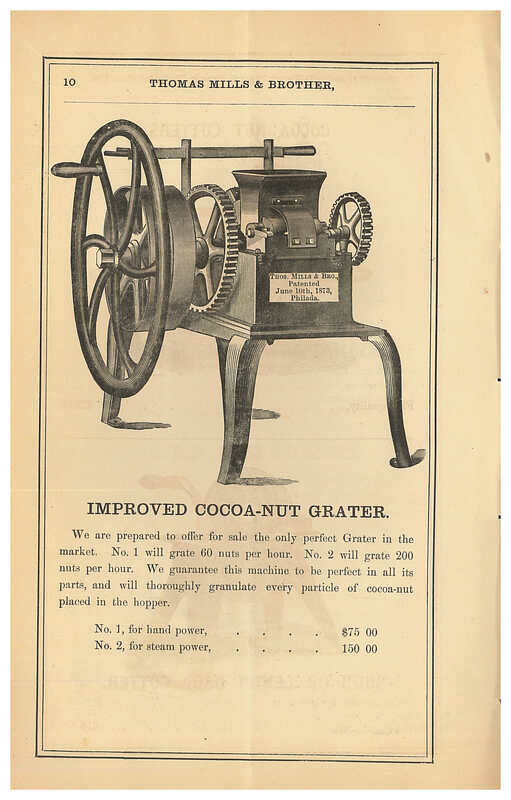 The Improved Cocoa-Nut Grater, shown below, was guaranteed to “thoroughly granulate every particle of cocoa-nut placed in the hopper.” There were two models. No. 1 used hand power. It grated 60 nuts per hour. But Model No. 2 used steam power which meant it could grate much more–200 nuts per hour. Thomas Mills & Brother, Philadelphia, PA. Descriptive and Illustrated Catalogue of Goods, 1874, page 10, Improved Cocoa-Nut Grater. Candy might include almonds which meant the almonds had to be peeled. 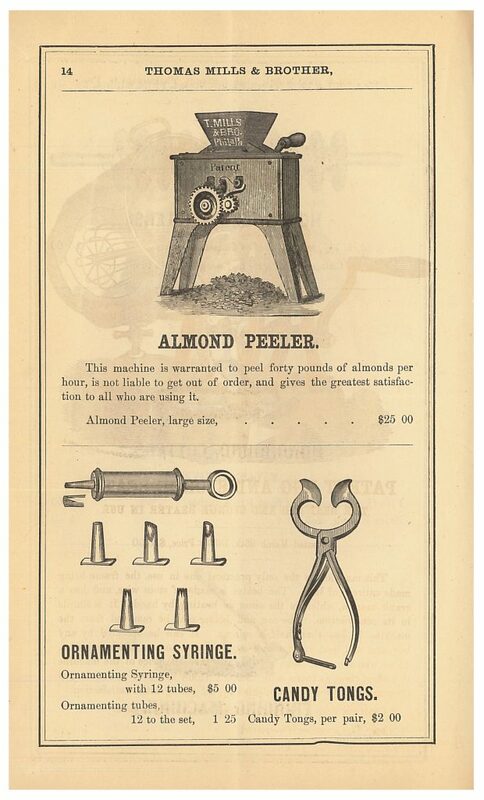 The Almond Peeler, shown below, was just the machine to help with that. It peeled forty pounds of almonds per hour. Thomas Mills & Brother, Philadelphia, PA. Descriptive and Illustrated Catalogue of Goods, 1874, page 14, Almond Peeler, Ornamenting Syringe, and Candy Tongs. 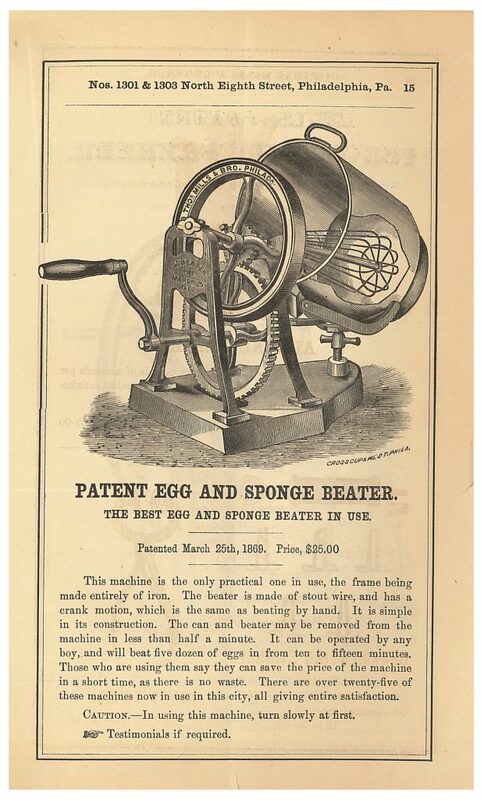 Thomas Mills & Brother, Philadelphia, PA. Descriptive and Illustrated Catalogue of Goods, 1874, page 15, Patent Egg and Sponge Beater. Candy could also be a toy. Below is the side view of the Mills’ Excelsior Toy Machine. This machine made candy toys, or candy in the shape of fun toys, like animals, sailboats, rocking horses, and trains. It produced 33 different candy toys. Each candy toy had a flat base to stand upright. 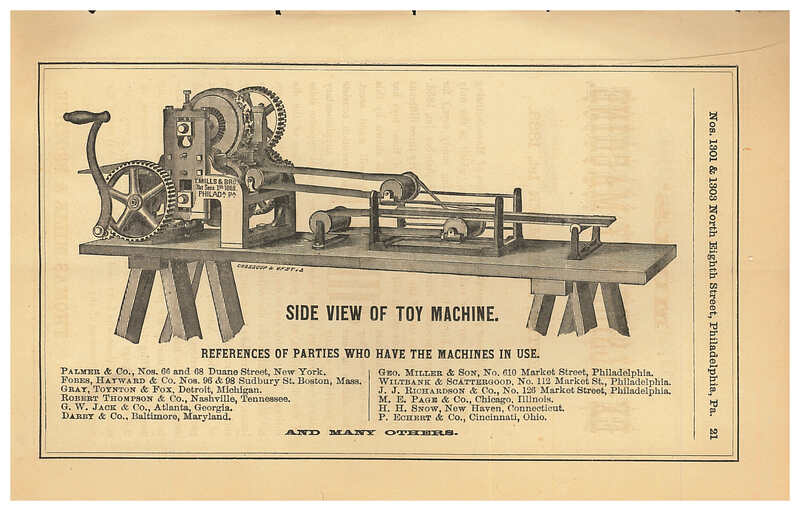 Thomas Mills & Brother, Philadelphia, PA. Descriptive and Illustrated Catalogue of Goods, 1874, page 21, Mills’ Excelsior Toy Machine. 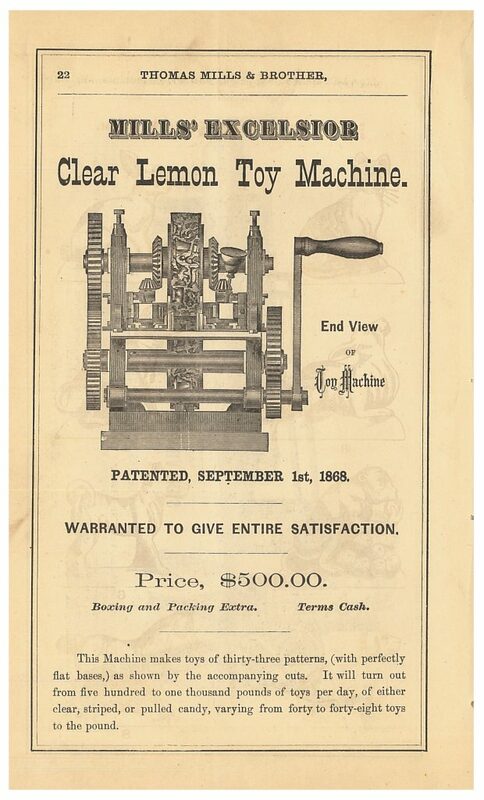 Thomas Mills & Brother, Philadelphia, PA. Descriptive and Illustrated Catalogue of Goods, 1874, page 22, Mills’ Excelsior Clear Lemon Toy Machine. Wondering what those 33 candy toy patterns might be? 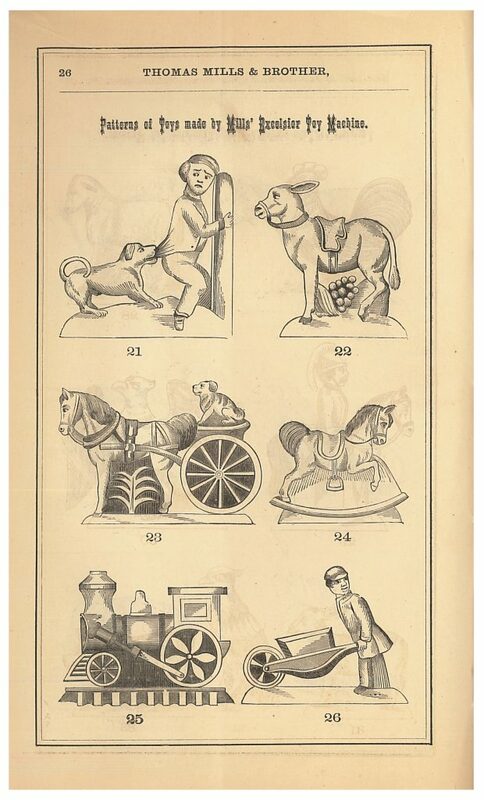 Take a look below for a few examples–a train, a rocking horse, a dog pulling on a boy’s shirt, a horse pulling a wagon with a dog sitting in the wagon, and more. Thomas Mills & Brother, Philadelphia, PA. Descriptive and Illustrated Catalogue of Goods, 1874, page 26, candy toy patterns. 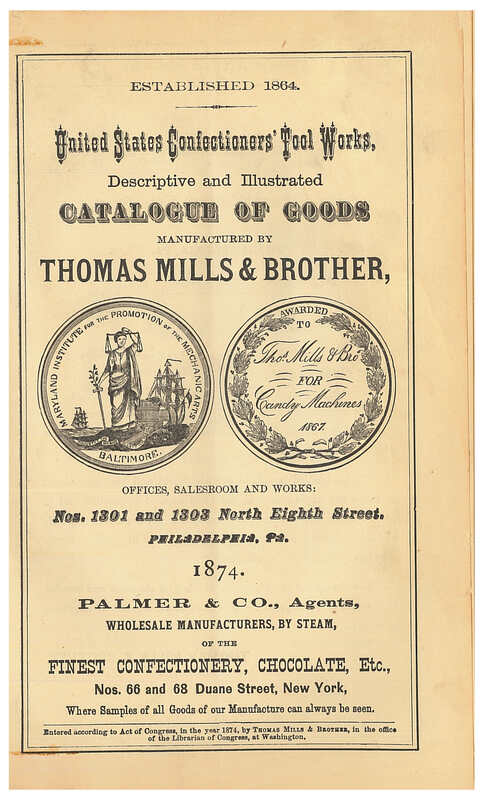 Descriptive and Illustrated Catalogue of Goods and several other catalogs from Thomas Mills & Brother are located in the Trade Literature Collection at the National Museum of American History Library. Interested in more candy? Take a look at previous posts highlighting candy toys from this same catalog, candy recipes from 1907, and Easter candy. If you are still looking to sell your candy making machine I’m very interested. I use antique candy equipment to make candy and preserve history. I’d really appreciate it if you could send me some photos and a price. Suzanne, if your looking to sell the machine, I would be interested. Hullo,I have a fine Thomas Mills improved verticle cutter and would like to send you images. I may be interested in purchasing your vertical cutter. I would appreciate it if you could send me some photos and a price. I may be interested in purchasing your copper pot. I would really appreciate it if you could send me some photos and price. Has any one come across a candy machine stamped with Jewell & Co Waltham, Ma or in some way related to him? Hi. I work for the Habitat for Humaity and came across a Thomas Mills & Bro. stamped item that i have no idea what it is. Can you help? Will send pictures.